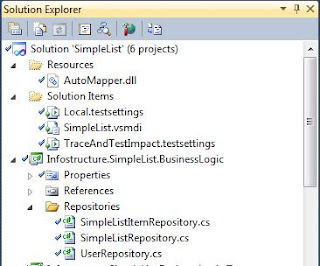 Full Visual Studio 2010 integration - gives you those nice neat “checks” and other icons in the solution explorer, to indicate modifications, new items, etc. It's just like a bought one! System.Data.SqlClient.SqlException: Invalid object name 'dbo.Users'. 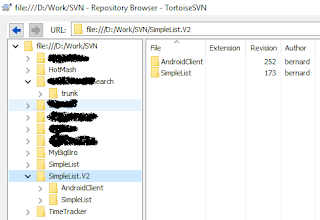 In the piece of work I'm doing a the moment (an MVC app that manages a bunch of “simple lists”) I want to be able to serialise to JSON where an incoming GET request is not ASP.NET authenticated and a UID and PW has come through on the query string. Ran into trouble immediately with serialising my EF POCO objects to JSON, as they have circular references. So, I'm translating to ViewModels. Basically if I don't translate to my matching ViewModels, then I get ye olde "A circular reference was detected while serializing an object of type" exception. Enter the fantastical AutoMapper library. The code samples I've provided, etc, are a bit rough-and-ready as usual. However, should you happen to have stumbled on this post, and end up following some of it's recommendations, then I hope you enjoy using these features/tools as much as I have! Unfortuantely AutoMapper uses Reflection.Emit, which is not allowed in a Medium Trust environment (i.e. my shared hosting web host). I've reverted to a custom mapping implementation for the time being, since what I'm doing right now is not DTO-intensive. AutoMapper is great though and ValueInjector looks interesting.